NEMA 4X (IP66) Non-Metallic Fiberglass Electrical Enclosures, Large Wall Mount Cabinets from 36x30" to 60x36"
OM-AM Empire Series non-metallic fiberglass enclosures are designed to insulate and protect electrical controls and components in both indoor and outdoor applications and are especially well suited for higher temperatures and corrosive environments. 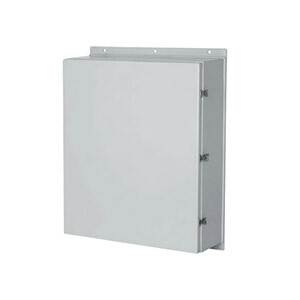 These NEMA 4X (IP66) fiberglass electrical wall cabinets protect from dirt, dust, oil and water. The 3 point latch system comes with a pad locking 316 SS handle, this will latch the door at the top, bottom and middle of the door. Electrical enclosure, inside box size 36.5 H x 30.5 W x 12.03"D, overall size 41.5 x 31.76, usable depth 12.48"